Published: Aug. 29, 2014 at 12:43 a.m. 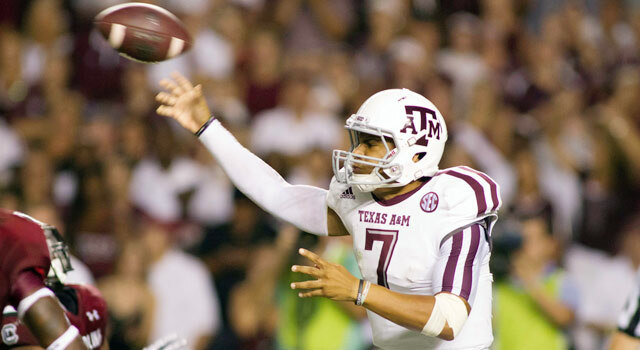 Updated: Aug. 29, 2014 at 12:23 p.m.
Kenny Hill was every bit as efficient running Texas A&M's offense as his predecessor. That's what the college football world is likely saying after watching Texas A&M QB Kenny Hill put on a spectacular performance in his first collegiate start at South Carolina. The 6-foot-1, 215-pound sophomore completed 44 of 60 passes for 511 yards and three scores in a 52-28 victory over the Gamecocks. While those numbers certainly jump off the stat sheet at first glance, it was the poise, composure and efficiency that Hill displayed during his debut performance that impressed me the most when I watched the game from my press box seat at Williams-Brice Stadium. In fact, Hill's scintillating play in front of a raucous crowd on the road leads me to believe that he will not only be a star performer in the SEC, but he could be one of the young quarterbacks worth tracking over the next few years. From his exceptional arm talent and pocket presence to his unflappable demeanor directing the Aggies' fast-paced offense, Hill looked like a veteran playmaker at the position. He efficiently picked apart one of the SEC's premier defenses, while making it look easy in the process. Granted, the Aggies' spread offense is as quarterback-friendly as offenses come, with a number of quick routes, bubble screens and pop passes comprising the bulk of the game plan. But that shouldn't take away from Hill's brilliant execution and performance in his national debut. The kid was every bit as effective as his predecessor, Johnny Manziel, directing the Aggies' attack, but he is a more disciplined pocket passer with sneaky athleticism. Thus, the Aggies are capable of running some read-option and speed-option concepts, while basing their offense around a quick-rhythm passing game that stretches the defense far and wide. With Hill proving to be a spectacular playmaker ideally suited for the Aggies' system, Texas A&M might need to clear some room in the trophy case for another stiff-armed statue that represents the top player in college football. » Texas A&M OT Cedric Ogbuehi was as good as advertised in his first game at left tackle for the Aggies. The 6-5, 305-pound senior dominated the line of scrimmage with his combination of size, strength and power, while also exhibiting the technical skills that scouts covet in premier offensive tackles. He repeated stoned Gamecock defenders with strong jams following short sets, which left them unable to harass Hill in the pocket. Consequently, the Aggies' young QB enjoyed a banner day without facing much pressure from a defense that normally bullies passers into submission. Given the importance NFL evaluators place on protecting the quarterback in the pocket, Ogbuehi's strong showing at left tackle will only enhance his value in war rooms around the league. » South Carolina RB Mike Davis was a bit of a disappointment against the Aggies. The highly touted runner only mustered 15 yards on six carries and didn't make a significant impact for the Gamecocks' offense. Now, I understand that Davis has been dealing with some injuries, but I was surprised at his limited workload. There were whispers from NFL scouts in attendance suggesting that Davis hasn't been the hardest worker in practices during training camp, and his minimal contributions could be a reflection of the Gamecocks' coaching staff showing their displeasure in his work habits.